The successor to the original Chrono from Pirelli. The Chrono series 2 is designed to maintain control and provide further traction in all situations that it's predeccsor. With a high level of silica introduced in to the tread compound the Chrono 2 remains durable throughout the winter months, and in mild winters has enough grip to maintain perfomance right through with no need to switch to winter tyres. 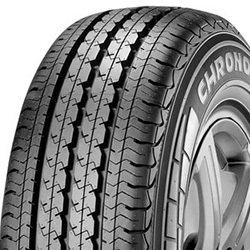 With excellent handling even under high payloads and exceptionally low noise emissions for a tyre of this calibre and this heavy duty, the Chrono 2 is a great choice for commercial vehicles and vans alike.